Background: This is the first study on phenotype frequencies of various blood group systems in blood donors of south Gujarat, India using conventional tube technique. Material and Methods: A total of 115 "O" blood group donors from three different blood banks of south Gujarat were typed for D, C, c, E, e, K, Jk a , Le a , Le b , P 1 , M, and N antigens using monoclonal antisera and k, Kp a , Kp b , Fy a ,Fy b , Jk b , S,s, Lu a , and Lu b antigens were typed using polyclonal antisera employing Indirect Antiglobulin Test. Antigens and phenotype frequencies were expressed as percentages. Results: From the 115 blood donor samples used for extended antigen typing in the Rh system, e antigen was found in 100% donors, followed by D [84.35%], C [81.74%], c [56.32%], and E [21.74%] with DCe/DCe (R 1 R 1 , 40.87%) as the most common phenotype. k was found to be positive in 100% of donors and no K+k- phenotype was found in Kell system. For Kidd and Duffy blood group system, Jk(a+b+) and Fy(a-b-) were the most common phenotypes with frequency of 52.17% and 48.69%, respectively. In the MNS system, 39.13% donors were typed as M+N+, 37.39% as M+N-, and 23.48% as M-N+. S+s+ was found in 24.35% of donors, S+s- in 8.69%, and S-s+ as the commonest amongst donors with 66.96%. No Lu(a+b+) or Lu(a+b-) phenotypes were detected in 115 donors typed for Lutheran antigens. A rare Lu(a-b-) phenotype was found in 2.61% donors. Conclusion: Data base for antigen frequency of various blood group systems in local donors help provide antigen negative compatible blood units to patients with multiple antibodies in order to formulate in-house red cells for antibody detection and identification and for preparing donor registry for rare blood groups. The criteria for selection of donor cells focuses on absence of antigens on donor cells for the antibodies that are detected in the patient's serum needing transfusion during antibody detection and identification. Successful antibody detection and identification in patient's serum depends on the use of appropriate and comprehensive screening and panel red cells. Knowledge of phenotype frequencies of major blood group systems help in formulating in-house red cells for antibody detection and identification. Because India is a vast country with several distinct population groups, there is an obvious need for phenotype frequencies to be determined in different parts of India. The current study was performed with a futuristic aim to formulate in-house screening and identification of red cells and to have an estimate of phenotypes of major blood group systems prevalent in the blood donors of south Gujarat in India. Very few studies are available from India reporting antigen frequencies of other blood group systems. , No study till date has reported the incidence of red cell phenotypes of other blood groups in south Gujarat. The present study is the first report on the incidence of other blood groups in blood donors of south Gujarat. Total 4 ml of blood sample was collected in EDTA tubes from "O" blood group regular and repeat voluntary donors after taking their consent for using their blood samples in the present study. These samples were collected from a) Voluntary blood bank, Sardar Smarak Hospital, Bardoli, b) Loksamarpan Raktadan Kendra, Varachha Road, Surat, and c) Blood Bank, New Civil Hospital, Surat. The objective behind collecting blood samples from different blood banks was to have representative samples in the study from urban, semi-rural, and rural areas of south Gujarat, India. All collected "O" blood group samples were randomly selected for red cell antigen typing of the following blood groups Rh (D,C,E, c, e ), Kell (K, k, Kp a , Kp b ), Duffy (Fy a , Fy b ), Kidd (Jk a , Jk b ), Lewis (Le a , Le b ), P(P 1 ), MNS (M, N,S,s ), and Lutheran (Lu a , Lu b ). The blood grouping for the above antigen types was done by conventional tube technique following manufacturer's instructions. Agglutination reactions in positive test results were recorded using agglutination viewer and were graded as 1+ to 4+. The antisera used for the study were from Diamed, Switzerland and Immucor Gamma, USA. The antihuman globulin reagent used in the study was from Diamed, Switzerland. The typing of D,C,c,E, e, K, Jk a , Le a , Le b , P 1 , M, and N antigens was done using monoclonal antisera, while that of k, Kp a , Kp b , Fy a ,Fy b , Jk b , S,s, Lu a, and Lu b antigens was done using polyclonal antisera employing IAT [Table 1] and [Table 2]. The donor blood samples that turned out to be negative for a particular antigen in the IAT were confirmed by check cells (Coomb's control cells). The check cells used in the study were a combination of in-house cells and ready-to-use cells from Diamed, Switzerland. The quality of the antisera used in the study was checked by grouping of known antigen-positive and antigen-negative red cells present in commercial red cell panels. Incidence of red cell antigens of various blood group systems (Kell, Kidd, Duffy, Lewis, Lutheran, P, and MNSs) found in the present study is depicted in [Table 3] and [Table 4]. In the Kell blood groups system, 6.09% (7/115) donor were typed as K antigen positive and 100% as k antigen positive. K+k- phenotype was not found in any of the donors. Kp(a-b+) was the most common phenotype (98.26%; 113/115) and Kp(a+b+) phenotype was found to be rare (1.74%; 2/115). For the Kidd and Duffy blood group system, Jk (a+b+) and Fy(a-b-) were the most common phenotypes, which are 52.17% and 48.69%, respectively, observed. No Jk (a-b-) phenotype was observed and Fy(a-b+) phenotype was found only in 4.35% of the population in the present study. In the Lewis blood group system, Le(a-b+) (65.22%) was the most common phenotype observed and no Le(a+b+) was observed. In the Lutheran blood group system, Lu(a-b+) (97.39%) was the most common phenotype observed and no Lu(a+b+) and Lu(a+b-) was observed. P1 antigen was observed in 64.35% donors. M+N+ and S-s+ was the most common phenotype observed in the MNS blood group system, which is 39.13% and 66.96%, respectively. In our study, M+N-S-s+ (27.83%) and M+N+S-s+ (25.22%) were the most common phenotypes, whereas M-N+S+s- (0.87%) was least common. No M+N+S-s- , M+N-S-s-, and M-N+S-s- phenotypes were found in the present study. In situations where clinically significant antibodies are identified in patient's serum, antigen-negative donor units for such cases can be easily retrieved from the donor database of various blood groups available with a blood transfusion centre. For this particular reason, all blood banks should have the donor database on antigen frequency of other blood group systems in their local donor population. The incidence of D antigen differs in different ethnic population, being 85% in Whites and 92% in Blacks. ,,,, In the present study, D antigen was found to be present in 84.35% of donors, which is comparable with that for Whites but it is less than reported in other studies from India. , The reason for this discrepancy is that the data in our study is skewed and biased because of small numbers (only 115) of samples. The frequency of C antigen in our study was 81.74%, which is high as compared to 68% (in Whites) and 27% (in Blacks), while this is comparable with the findings of study by Thakral  (84.76%). c antigen was found to be positive in 56.52% of our samples, which is less than that of 80% (in Whites) and 96% (in Blacks); however, it is comparable with that in the study by Thakral  (52.82%). A significant difference was noted in the frequency of C antigen when donors were segregated as D+ and D-. C antigen was associated with 93.81% of D+ donors and it was present in only 16.67% of D- donors, suggesting that C antigen is more prevalent on D+ red cells. In the present study, c antigen was found in 88.8% of D- donors, while it was detected in only 50.52% of D+ donors. In the Kell system, k antigen was found in 100% of donors, which is comparable with that of 100% incidence in Thakral study. The most frequent phenotype in Kell blood group system was Kp(a-b+) with incidence percentage of 98.26%, which is comparable with that of Whites (97.7%) and with that in the study by Thakral (99.05%). Jk (a+b+) with incidence of 52.17% was the commonest phenotype in Kidd system and is comparable to that found by Nanu and Thapliyal, Thakral, and the white population (48.37, 49.21, and 49%, respectively). Fy(a-b-) phenotype with a frequency of 48.69% was found to be the commonest in the Duffy system. This is in contrast to that observed in Thakral (0%) and Nanu and Thapliyal (0.44%); however, it is comparable to the frequency of Fy(a-b-) phenotype observed in Blacks (68%). Duffy antigens are associated with malarial infections caused by Plasmodium vivax. South Gujarat being an endemic zone for malaria, high Fy(a-b-) phenotype frequency may be due to selective pressure. 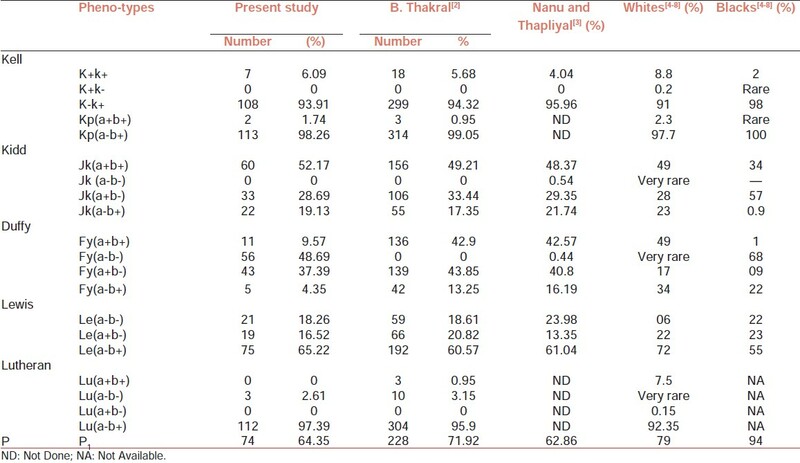 The phenotype Fy(a+b-) with frequency of 37.39% in our study is comparable with that found by Nanu and Thapliyal (40.8%) and Thakral (43.85%). Larger studies for Duffy antigen typing in malarial endemic zones of India would give an insight into the phenotype frequency of Fy(a-b-) prevalent in India. In Lewis system, Le(a-b+) with 65.22% frequency was the most common phenotype and is comparable with that of Thakral  (60.57%) and Nanu and Thapliyal  (61.04%). Le(a-b-) phenotype is found in 18.26% of sample, which is higher than that reported for Whites (06%). A very rare phenotype Lu(a-b-) of Lutheran system in Whites was found in 2.61% of our samples and is comparable with the study by Thakral (3.15%). Lu(a+b+) is reported to be 7.5% in Whites, while in our study no Lu(a+b+) was found in 115 samples. Lu(a-b+) with a frequency of 97.39% was the commonest phenotype in Lutheran system in our study and it is comparable with the finding of Thakral (95.9%) and in Whites (92.35%). In the MNSs blood group system, M+N- phenotype was found in 37.39% of sample, which is comparable to that in Thakral study (38.5%); however, this phenotype is much less in Whites and Blacks with a frequency of 28% and 26%, respectively. The phenotype S-s+ with a frequency of 66.96% is higher than that reported by Thakral (43.53%) and Whites (45%), while it is comparable to that observed in Blacks (69%). The phenotypes M+N-S-s+ (27.83%) and M+N+S-s+ (25.22%) in our study were more common than 15.8% and 13.88% reported by Thakral, respectively; however, they were comparable with those reported by Nanu and Thapliyal as 22.61% and 27.83%, respectively. The phenotype M+N+S+S+ reported as highest in MNS system with a frequency of 19.55% by Thakral is found only in 10.43% of samples in our study. The drawback of our study was the small size of the samples. It is always prudent to have an appropriate sample size for deriving valid conclusions in regard to antigen frequency in a defined population. The present study included samples from different talukas of Surat district with a population around 40 lacs. Estimate of adequate sample size for such studies can be derived at using PS power and sample size program available for free on the Internet. However, we did extended antigen typing in only 115 donor samples as the study was self-sponsored by the authors and the cost was a restraining factor for including large number of donor samples in study. The conventional tube technique for extended antigen typing is definitely time-consuming and labor-intensive; however, it can be used in any of the smallest blood bank with minimal resources. It does not require sophisticated equipments as needed for column agglutination technology. Moreover, the cost is quite low when conventional tube technique is used instead of column agglutination. Considering the above facts, the conventional tube technique is a good option for carrying out such studies where facilities for column agglutination are not available. Outcomes of such studies can be used to formulate a Rare Blood group Donor registry (donors lacking high frequency antigens) at national level, and patients (especially those requiring multiple transfusions) with antibodies against high frequency antigens can be directed to such Rare Blood Group donor registry. Blood banks can also use such data for formulating in-house red cells (screening and panel cells) for detection and identification of clinically significant antibodies in patients. An indigenous homemade screening and panel red cells will have definite advantage over imported commercial panels in terms of cost effectiveness and having representation of antigens from local donors in the screening and panel red cells for antibody detection and identification. When such indigenous screen and identification panels are formulated, they can be compared with commercial screening and panel cells for their performance in antibody detection and identification. 1. Chapman JF, Elliott C, Knowles SM, Milkins CE, Poole GD. Guidelines for compatibility procedures in blood transfusion laboratories. Transfus Med 2004;14:59-73. 2. Thakral B, Saluja K, Sharma RR, Marwaha N. Phenotype frequencies of blood groups systems (Rh, Kell, Kidd, Duffy, MNS, P, Lewis, and Lutheran ) in north Indian blood donors. Transfus Apher Sci 2010;43:17-22. 3. Nanu A, Thapliyal RM. Blood group gene frequency in a selected north Indian population. Indian J Med Res 1997;106:242-6. 4. Denise M. Harmening. Modern blood banking and transfusion practices. 5 th ed. Philadelphia: FA Davis Company; 2005. p. 163-90. 5. Brecher ME. Technical manual. 15 th ed. Bethesda: American Association of Blood Banks; 2005. p. 304-58. 6. Sally V. Rudmann. Blood Banking and Transfusion Medicine. 2 nd ed. Philadelphia: Elseiver Saunders; 2005. p. 86-146. 7. Reid ME, Lomas-Francis C. The blood group antigen facts book. 2 nd ed. London: Elsevier Academic Press; 2004. p. 29-296. 8. Daniels G. Human blood groups. 2 nd ed. Oxford: Blackwell Science Publications; 2002. p. 7-348. 9. Bhatia HM. Procedures in blood banking and immunohematology. Blood Group Reference Centre. New Delhi, ICMR; 1997. p. 55-63. 10. Cleghorn TE. Mnss gene frequencies in English blood donors. Nature 1960;187:701. 11. Singh KN, Tiagi GK, Pradhan S. Study of Rh isoimmunization in pregnant women. J Indian Med Assoc 1969;52:362-5. 12. Murphy MF, Derwad H. Pamphilon, Practical Transfusion Medicine. 3 rd ed. West Sussex: Blackwell Publishing; 2009. p. 244. 13. Voak D, Downie DM, Moore BP, Ford DS, Engelfrict CP, Case J. Replicate tests for the detection and correction of errors in anti-human globulin (AHG) tests: Optimum conditions and quality control. Haematologia (Budap) 1998;21:3-16. 14. Langhi DM Jr., Bordin JO. Duffy blood group and malaria. Hematology 2006;11:389-98.